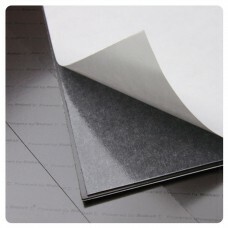 Plain Ferro sheet with a release paper covered acrylic adhesive on one side. Yes only £3.00 plus VAT per metre for a 15 metre rolls (Unfortunately smaller quantities not available on this product - its a 15 metre roll or nothing). Smaller quantities are availalable on similar products just not this one, sorry. We accidentally put an extra 0 on the order and got more stock than required. When it's gone it's gone!